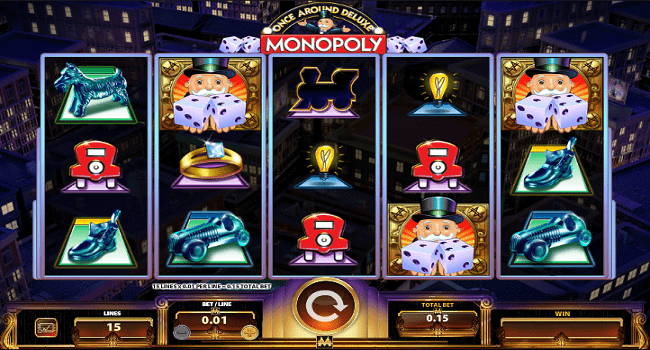 Monopoly Once around Deluxe slot is one of the most popular slot machines powered by WMS software for which reels are 5 and paylines are 15. This is a highly playable slot machine can be played either by using mobile phones or desktop. This slot offers a jackpot of 20,000 coins on your total stake. You can play Monopoly Once around Deluxe slot using coin sizes 15 pence per spin to up to £75 per spin at any WMS casino. The game features a bonus round which is known as Twice Around feature. When this feature is triggered it will double all your winnings as well as cash prizes for various properties. This slot is inspired by real estate business and you can become a mogul of real-estate business if playing well. The game possesses wild (Mr Monopoly himself), scatters and an exciting bonus symbol. The wild symbol of this game can replace all other symbols on your screen except the Community Chest and bonus. If you land 3 or more of the wild symbols (Mr Monopoly symbol) on anywhere on reels, it will trigger once around deluxe feature. In this feature you will begin to choose a token from a number of symbols like hat, cat, car, dog and boot. Now it is your objective to advance the token to the next level by using the dice. Now after rolling the dice if you land on GO option then you will get the bonus feature and you can trigger Twice Around feature giving you up to 2x multiplier on your total stake and if you land on option GO to JAIL, or Income Tax or Luxury Tax, Just Visiting/jail then you will not get any award and there is no win for you. I have played Monopoly Once Around Deluxe slot many times and love to play this slot always. I think you should try this slot at least once and you will see the difference of playing it online at any WMS based online casinos.